Kim did a very long round of P2 – 73 days straight. She did it successfully and has already been maintaining her weight loss for over 5 months since then. Smartcakes – Kim loves these! They would make great P3 treats! Smartcakes come in several flavors and are made with fiber and sweetened with erythritol; no sugar, no carbs. Note: order these through their website, not Amazon- many amazon reviews noted product that was old/moldy probably because of being stored improperly at Amazon warehouses- the product from their site is more reliably fresh. Travel Scale – Kim traveled a lot while doing the protocol and always had a bathroom travel scale with her. According to Kim, she lost weight as a teenager through exercise and eating better and she successfully kept the weight off throughout high school. However, she gained it back in college. “Pizza and beer, you know.” she added. Kim had also successfully lost weight a few years back through juicing and raw food. However, according to her, because she did not have an endgame or a structured plan after the diet, she ended up gaining the weight back after a year of traveling. It was after getting back from a Tahiti cruise with her friends that Kim decided she needed to lose weight. Molly, one of the friends she went on the cruise with, had successfully lost weight through the hCG diet. After seeing her pictures and seeing how great Molly looked, Kim decided she needed to take action. Her concern for her health was also major contributor to Kim’s decision to go on another diet. Her blood pressure had risen to 145/97 after she got back from the cruise. She also had a family history of diabetes from her mother’s side of the family. She explained how she lost both her mother and grandmother to complications from adult onset diabetes. 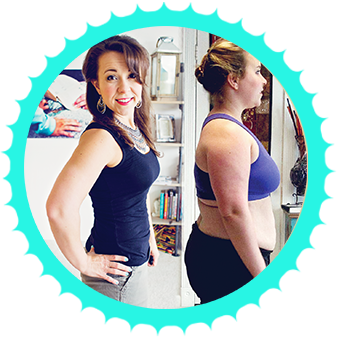 After doing her research on the hCG diet and finding hCGers (including yours truly) and hCG resources online, Kim decided she was going to try it. Kim did something unique in that she did a very long round of P2 – 73 days to be exact! It is important to stress that Kim went into the diet feeling 100% ready, both mentally and physically. She had no issues and actually felt great the whole time she was on her very long P2 round. Kim averaged a weight loss of 0.58 lbs per day and ended up losing 43 lbs in P2. Kim was surprised at how quickly the hCG injections worked on her. She was down a full size within 3 weeks of starting the injections. “I went from a size 16 to a size 8 pretty quickly. It was so fun dropping sizes.” Kim ended up losing 43 lbs at the end of P2. Kim used the 200 iu dose and was very specific about doing her injections at 7:30 AM everyday, using her stomach and legs as injection sites. She also pretty much followed the original protocol but ate 700 calories a day instead of just 500. Kim also believes that, being in menopause, the hCG injections actually balanced her hormones because she does not experience hot flashes anymore. Even her heartburn does not bother her anymore. After her extended P2 round ended, Kim’s blood had gone down to 120/82, her blood sugar was at 94 and her resting heart rate was at 59. Kim did her P2 according to what she knew – both mentally and emotionally – would work for her best. One of my recommended reads, The Four Tendencies by Gretchen Rubin, comes to mind because of this. The way we are motivated to do things is different. Within the hcg context we actually should not approach it the same with everyone else. Depending on what type of personality you have, you may approach it differently and that actually may lead to better success for you. Going 73 days on P2 is already a feat, but Kim even traveled twice within her 73-day P2 protocol. Kim said it’s all about being prepared and not thinking of the trip as a hindrance to the protocol. She brought her injections which were kept cold in blue ice and packed them in her checked luggage to avoid security issues. She also made sure to bring hard boiled eggs and apple slices with her to eat while on the plane. It’s amazing how she was able to stick to her P2 diet even while traveling. Kim also traveled with a mini bathroom travel scale which she used to weigh herself everyday. She actually lost weight during her trips. Kim went on another vacation just as she started P3. According to her, she wanted to make the Turkey Chili recipe while on their vacation, so before they left, she got all the spices she needed and put them in a baggie. On their vacation, she just bought the meat and the other ingredients and threw it all together along with the spices. Look for a Whole Foods or a supermarket where you can buy your food or ingredients from. Make sure you have a fridge in the hotel or condo you’ll stay in. Travel with easy snacks or meals like hard boiled eggs and apple slices. Don’t be afraid to ask restaurants for your food and cooking preferences. You will find that they are usually accommodating. Bring your own sweetener (Kim made sure to bring Truvia all the time), since you never know what kind of sweetener is available where you will go to eat. Kim works out regularly. She does 1 to 1 ½ hours of walking 2 to 4 times a week based on what her schedule permits. She also does spin class and weight training once a week. She has also done Pilates for a long time. She and her husband, Michael, both do one hour of Pilates twice a week with a private instructor. She also loves doing fun activities like rollerblading and going to the trampoline park. During P2, Kim maintained her 1-hour, twice weekly Pilates and also walked for an hour twice a week. According to her, she felt better doing low impact exercises than not doing any exercise at all. Kim explained that she is a very regimented person so she needed a structured program, or an “end game” program, to follow that could motivate her. It’s an added bonus that the meals tasted great and are so fulfilling. Kim considers P3 as the scariest time of the diet because that is when you go back to eating more food. She is grateful for the program because she believes that P3 is not talked about enough and the information she got before was not specific enough. Kim did the simplified plan to save time and she loved batch cooking. When asked about the quality of the food and the portioning, Kim gushed about how flavorful the recipes are that everyone at home – her husband, mother-in-law, and even their toy poodle, Carly – love the food. Kim detailed their weekly meal prep; for breakfast, they do batch cooking 3 to 4 days of savory recipes (i.e. Taco Muffins) and 3 to 4 days of sweet (i.e. Chocolate Chia Pudding). They eat the same item/recipe everyday. For lunch they usually have a big salad with some type of protein, and for dinner her mother in law cooks every time, but they usually go out 2 nights a week. Kim would usually keep one portion of their dinner recipe for her lunch the next day. She added that they usually double the recipe to freeze a portion and have some for lunch the following day. Kim also drinks a cup of coffee and lots of lemon or lime mint water everyday. In the evening, once or twice a week, she has Smooth Move Tea. Kim explained that she’s not a leftover person (except if it’s pizza), but P3 to Life meals are her exception because all of the recipes are great. Even the girls at her salon will eat her leftovers because the P3 meals are so good. “I’m a picky eater, but P3 to Life recipes are wonderful.” she remarks. Kim found the portion sizes large, especially after she transitioned from P2. 2 Portions of the recipes would usually be enough for the 3 of them at home to eat. They love all the P3 to Life recipes, but their absolute favorite is the Almond and Herb Crusted Chicken recipe. Even her 8-year-old nephew, whom they saw while they were on vacation loved the recipe! Occasionally, they will have a P3 to Life smoothie or sorbet. Kim says that now that she has a healthy choice for dessert, she does not crave sweets so much. Being a dessert person, Kim says she needs to have something sweet or else she will obsess over it. I love variety, that’s why the meal plan has such an assortment of recipes. For people on the program who want to eat out or are craving a certain cuisine, there are recipes in the program that can offer you the variety you seek. Realize you may be mentally hungry but not physically hungry and that is OK.
Watch a video from hCGchica! When I would hit an obstacle I would search out a video from you and it would calm me down and give me ideas. Buy meat in bulk, portion it out, and freeze it. It is worth taking time to divide it and store it so you can just grab what you need to use, whenever you’re cooking. Kim also loves keeping one of their favorite recipes, Almond Crusted Chicken, in the fridge every time as another easy meal. Kim is a very busy lady. She owns a salon, Tropical Trenz Hair Salon, while her husband, Michael, owns Maui Wedding Adventures, a wedding planning business. Between the 2 businesses, Kim basically works 7 days a week, but she is not complaining because she loves both her jobs. She spends 30 hours a week in her salon and the rest of her time helping her husband with his business. Being the very busy lady that she is, Kim doesn’t have the time to cook and prepare her meals. That’s why having her mother-in-law, Claudia, live with them is a blessing. “If I did not have my mother-in-law living with us and doing the cooking, I’d need to hire someone to cook for us.” Kim says. It’s great that Kim mentioned being very busy with work and still being able to stick to the hCG diet and P3 to Life. I know cooking can be challenging if you have a full time job or if you just don’t have the energy to cook. Like me for example, with my chronic health conditions I get so tired cooking. We do have a very good family friend who we pay to cook for us weekly. It’s worth every penny and it has made my life so much easier. This is, of course, not an option for everyone, but it is an idea if your work or health make it difficult to cook. The support she received played a huge part in Kim’s success. Aside from her family, Kim’s friend Molly, who also found success on the hCG diet, served as her guide during P2. “For me, personally, I am successful due to the coaching from my friend Molly during phase 1 and phase 2, and from you, Rayzel, for P3 and P4.” Molly explains. She added that it was a huge bonus that her very supportive husband, her mother-in-law, Claudia, and even their poodle loves the recipes too. “And if I had questions, I would either ask Molly or watch a video on your website.” Molly added. Support makes a huge difference. Remember, ladies, there are so many resources available for you out there. Aside from the support you receive from family and friends, you can go online and join forums and social media groups of people who are on the diet. You can also visit hcgchica.com to watch or read about hCG diet success stories where we have over 70 interviews already. Kim also credits her mental preparedness for her success. She believes that it is vital to be ready to change your diet and eating habits permanently. Sticking to the program and not letting potential obstacles (like traveling, going to parties, or eating out) hinder you or set you back while on the protocol. “It is important to realize you have to make the change. You cannot go back to your old ways or else the weight will come back and the older you are the quicker that happens.” Kim says. She’s also proud of herself because the holidays came and went and she did not stray. For any of you ladies who’d like to check into the P3tolife program yourselves you can do so here!